In the wake of recent revelations on privacy breaches performed by state agencies, big data collection and increasing vulnerability to fraudulent identity theft and other forms of criminal activities focused on the use of the mobile internet, the necessity to think of better protection for sensitive data and dialogs has shifted from the public sector into the enterprise world and even to irritated consumers. Now that we all know that we cannot trust anyone, how do we get protection? Is the public sector well advised to purchase specifically armored versions of consumer level devices like smartphones and tablets? Can the enterprise and consumer segments afford these “hardened” devices? Join us in a 360 degree look at how Secocard helps solve all of these challenges. Voice encryption has for a long time been something which people thought came for free with the mobile network. Now that spying equipment the type of so-called IMSI catchers and other means of tapping tools which can turn your cell phone into a bug is readily available to everyone through online ordering, we all had to learn that eavesdropping on our mobile calls and chats is not only easily possible but is positively daily routine for some foreign agencies. And even if email encryption and decryption has made its way onto smartphones and tablets – with third party software in the case of some operating systems but still it is available – these applications will not protect you against spyware on the device which just needs to read your messages in decrypted mode from the device screen and surreptitiously forward the content to an intruder. Many attempts have been made to cover state officials from attacks on privacy and to protect state secrets by building specific “hardened” versions of smartphones and tablets which were ordered from the IT security industry at tremendously high price tags. Some of these products with virtualized operating systems and interfaces in combination with special boot-ROMs can effectively reduce or eliminate harm and so were rather successful like the so-called “Merkelphone” which the creators of Secocard had the pleasure of developing. One major nuisance connected with this approach is that the state official blessed with a “hardened” smartphone will envy her colleague without one because the protected version is at least one year back from the latest model that others can proudly flash. Since new smartphone and tablet models are being deployed almost at the speed of light, it is extremely cumbersome trying to catch up building “hardened” versions. So why not leave the communication devices as they come and link them up to an extra piece of very small dedicated hardware which takes care of all security jobs? 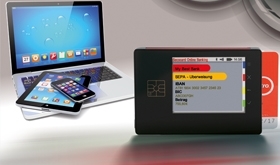 This is what Secocard is all about: An intelligent but extremely safe external token with its own screen and capacitive touch keypad communicates with a non-modified smartphone or tablet over Bluetooth© or LE Bluetooth© and runs all the security applications, while the smartphone or the tablet, respectively, just provide connectivity and their normal unshielded applications. The dedicated hardware is not much larger than a few credit or key cards stacked on one another, and can operate with practically every new smartphone and tablet model being sold today or unveiled in the future by the mobile industry. 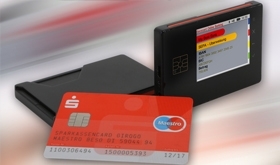 Low manufacturing cost combined with a broad selection of beneficial security functions from voice and email protection to secure online banking and secure mobile POS - Secocard is the product of choice to fulfill all of this: It maintains highest levels of communication security and will show its resistance against all forms and powers of intrusion in official tests upon request by public sector customers. In addition it can provide security in the banking and payment sectors. 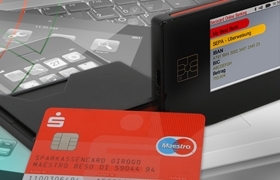 Yes, it is an extra device, but it is small and it is just one extra device, not a number of devices or tokens as public sector users, enterprise employees and consumers would have to use without Secocard to achieve the same portfolio of security applications at the same security level as provided by Secocard.